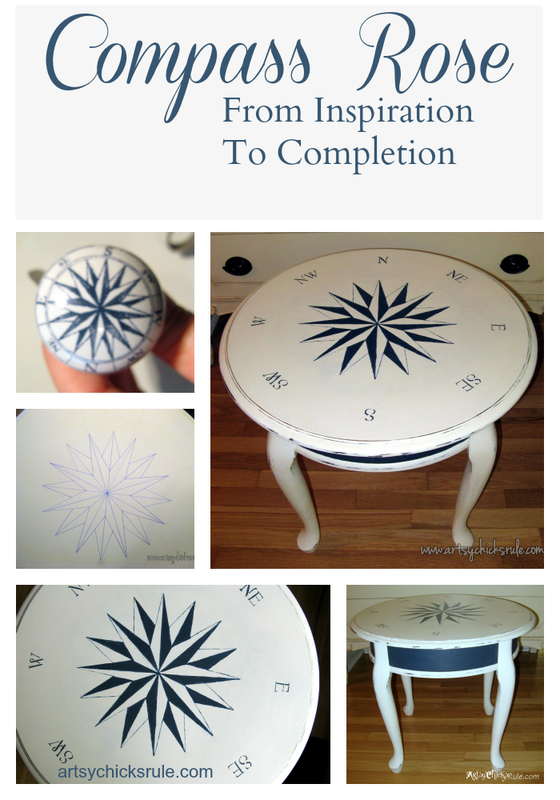 Create hand painted compass rose tables with ease! It’s really not that hard to do as I’ll show you in today’s post. 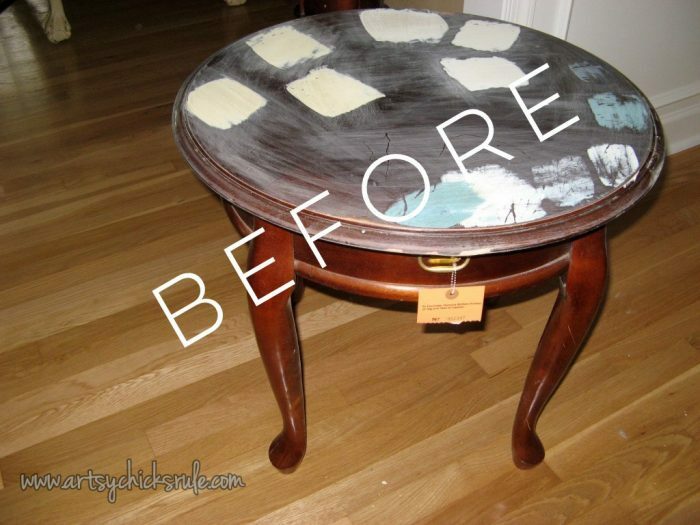 I actually had it written (many) months ago and you would have seen what I did to this poor little table long ago but…….it disappeared. But I learned my lesson pretty quickly after that. All posts get saved elsewhere once written. Something I suppose I should have been doing all along. Soooo…..
….guess it was time for a rewrite…finally. 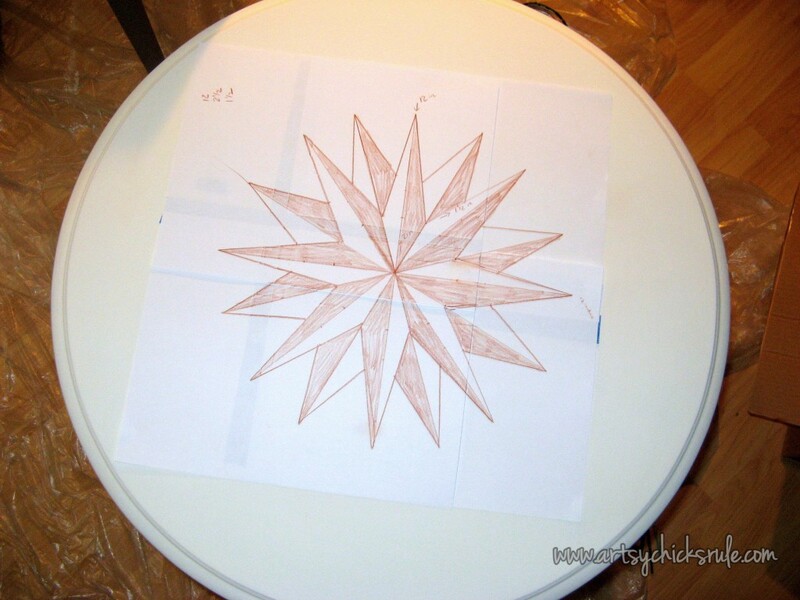 The 2 compass rose tables you see here were not for my own home. The first one above I painted early last year and it went to and was sold at the shop. The one below was a gift for my sister’s birthday….over a year ago. 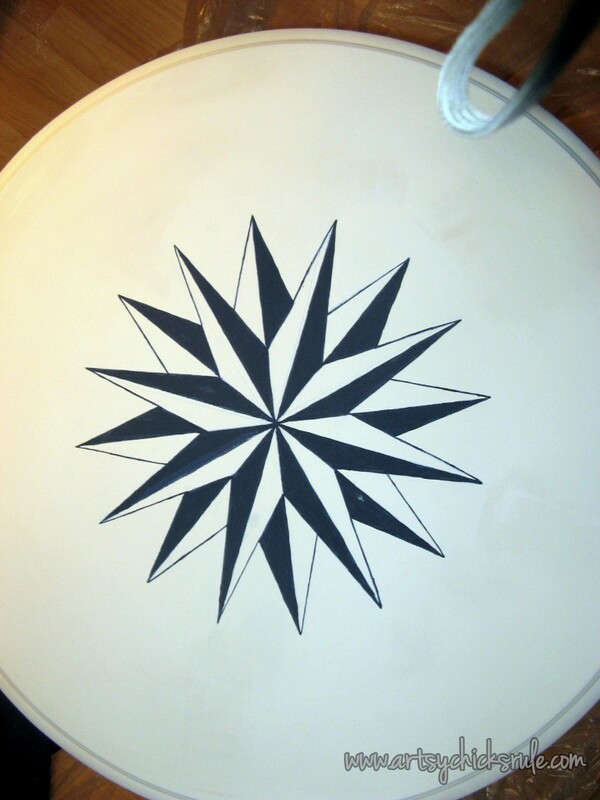 I love compass roses and anything nautical really. I should, I live right by the coast, right? I’m thinking more like the first one I posted but with the colors from the second one. 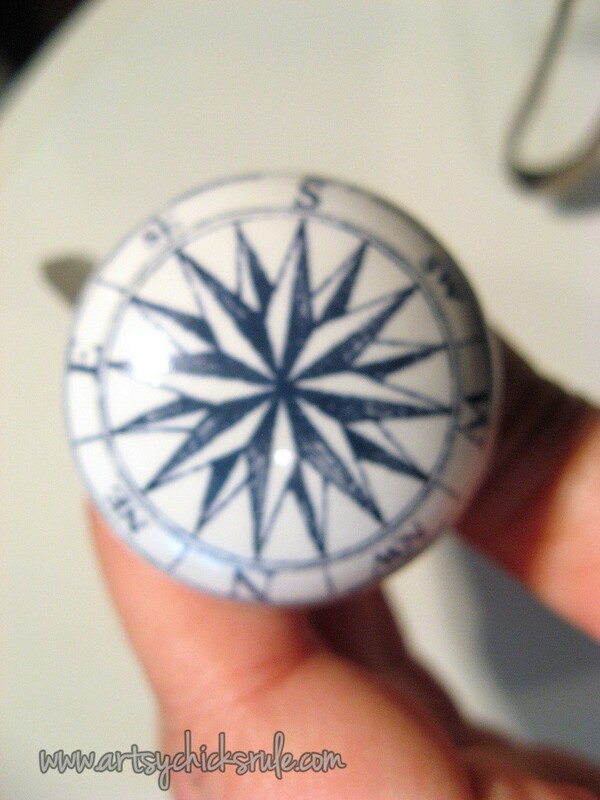 My inspiration for the first of the compass rose tables came from this little knob here…. Blurry, sorry, old photo. But you get the idea. 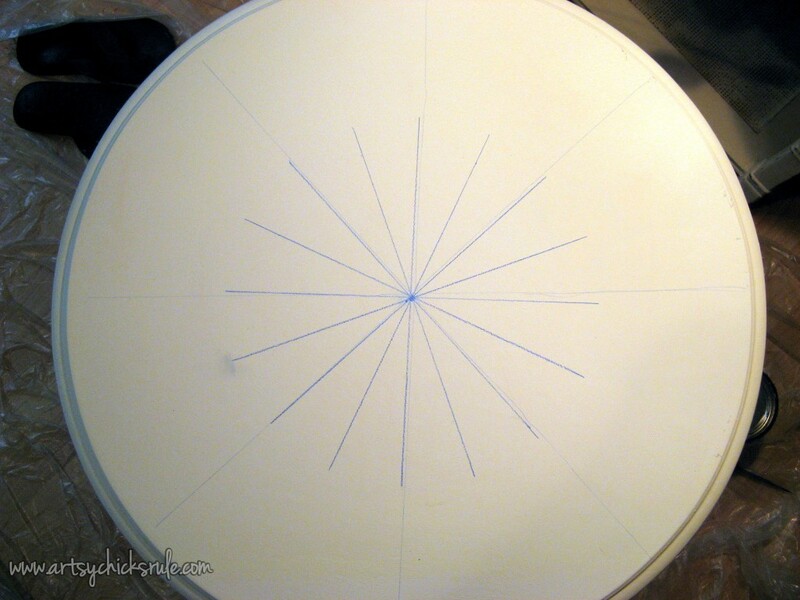 This was the table before the pretty paint job….I know….what the? Well, it was a whole $6 from the thrift store and it had THE MOST PERFECT super slick top to test out adhesion properties of some paints I was trying at the time. Poor, sad little thing stayed that way for quite awhile. 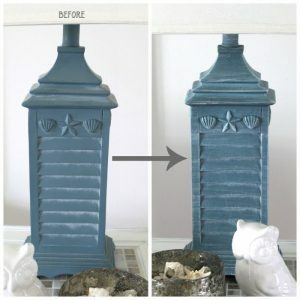 I sanded it well to smooth it out and then painted it with Pure White Chalk Paint and a blend of Napoleonic Blue/Graphite (also Annie Sloan Chalk Paint) to get the Navy color. Those are my hand made soaps in the background. I’ve been making soap for about 15 years now. I used to own my own company selling natural soaps and soy wax candles (among other natural products)…but that feels like it was a lifetime ago now. I am going to deviate a bit and do a natural soap post soon though. If you are interested, keep an eye out for it. UPDATE: See the “how-to” natural soap making post now, here. 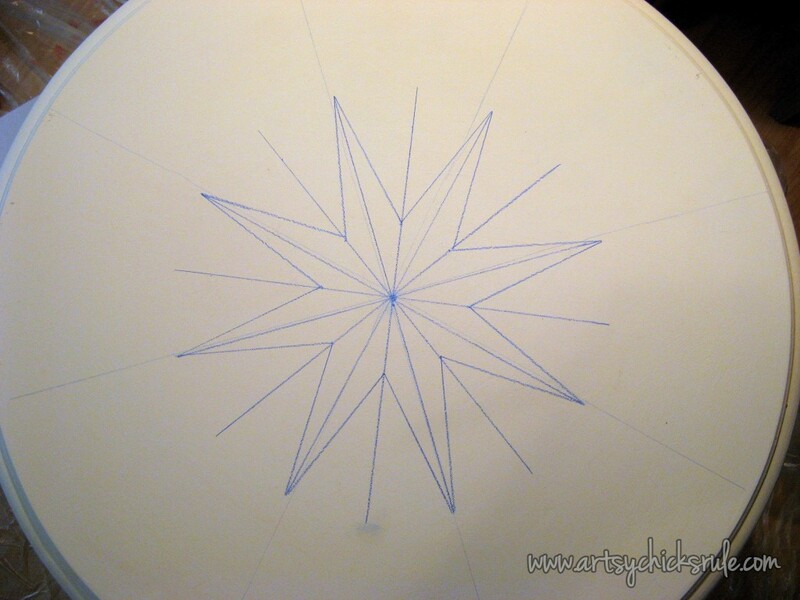 So back to the table…I drew the design on paper first to get the measurements how I wanted them for each line. 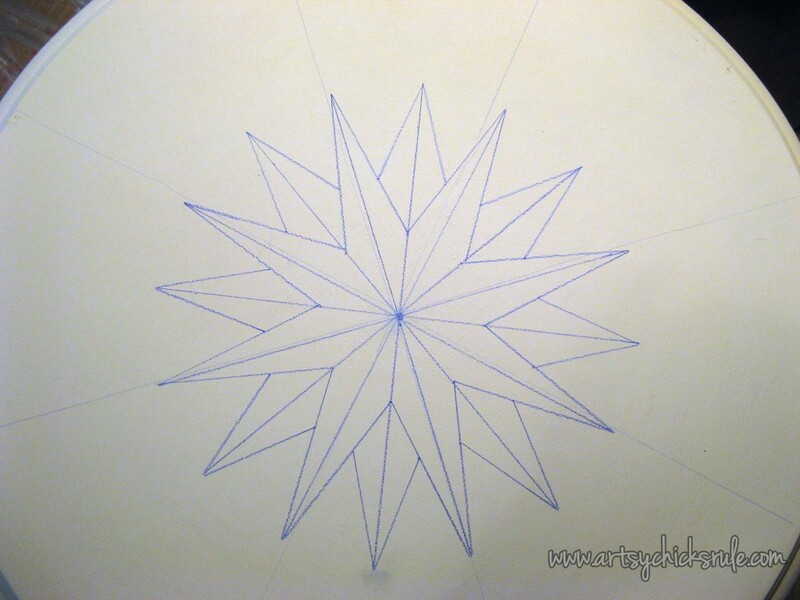 You can see the long lines I drew to find the center. And no, my other lines are not “perfect” but they don’t have to be….it’ll work out. Doesn’t look like much yet…..
Now it’s starting to look like something…. 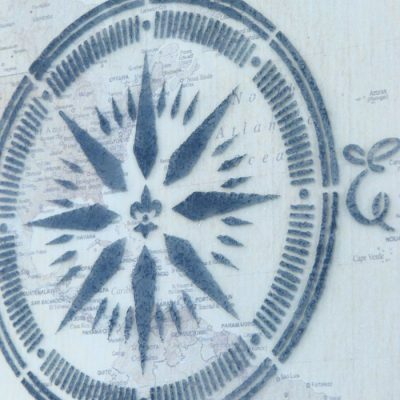 Areas of the compass rose painted in….a little tedious but like I’ve said in some of my other posts, I like this kind of mind numbing work. Added the lettering (using a stencil)….then distressed it all just a tiny bit….. Finished up with a coat of Clear Wax…. a little buffing and it was complete. These were both so much fun to do. I am really looking forward to starting on my new piece. I love both styles I did but just adore the complexity (not really, it only looks complex as you saw) of this one. Just measure, draw some lines and then paint “in the lines”, right? Anyone can do it! Looks great Nancy!! 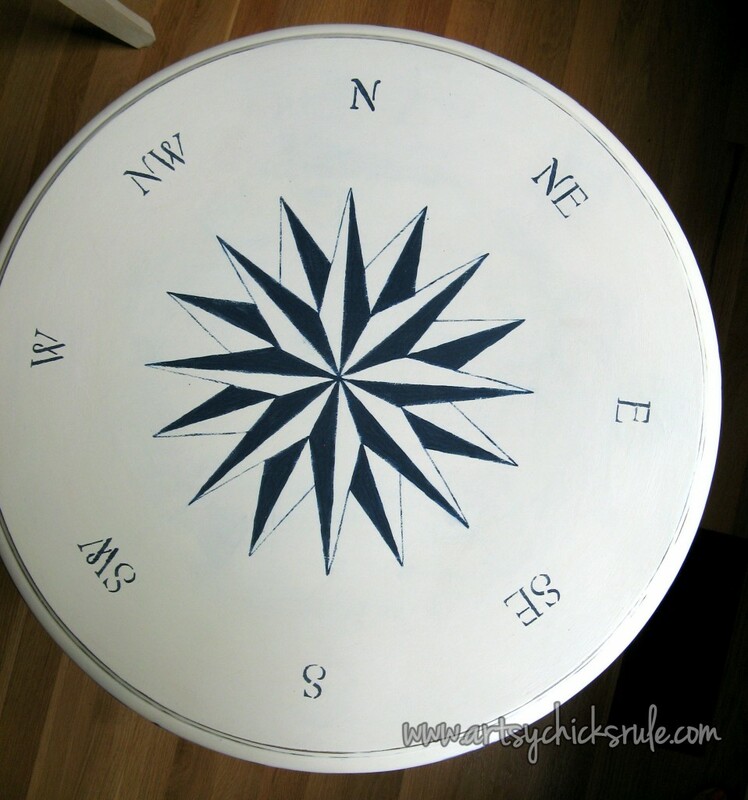 I had a perfect round table I was going to use for a similar compass design but ended up selling it to my daughter for a project she was doing! Haven’t found another one yet but keeping my eyes peeled! 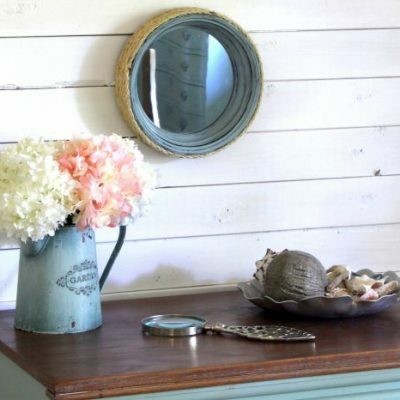 I love this kind of “upscale”nautical look too! Thanks Lorraine :) Yes, those little round end tables are “usually” easy to come by. But I had someone who wanted me to make one just like this one that I sold awhile back and I had a time finding one!! Figures..I’d come across them many times when I wasn’t looking. Your tables are really nice, what a great job you did. I have to ask you how you painted the middle shelve of the table. I feel like if I tried to do that it would come out really bad because you are working on the underside. I think I would have all kinds of brush makes because there is not much room to work. I know it is a silly question but I am just getting into painting furniture and need to learn the tricks of the trade if you do not mind. Once again your work is really nice, thank you for sharing with us. The blue area? I actually used a flat smallish artist’s brush to go around the edges. It’s easy to fix if you get a bit of paint where it doesn’t go…just take a small brush and touch up. I did that on this table. :) In the end, no one knows! 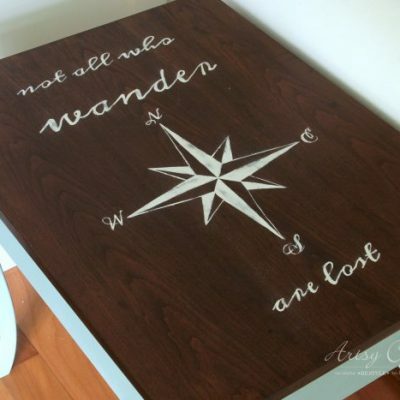 Love what you did with this table! I have the same table I found on the curb and I gave it a face lift several months ago. 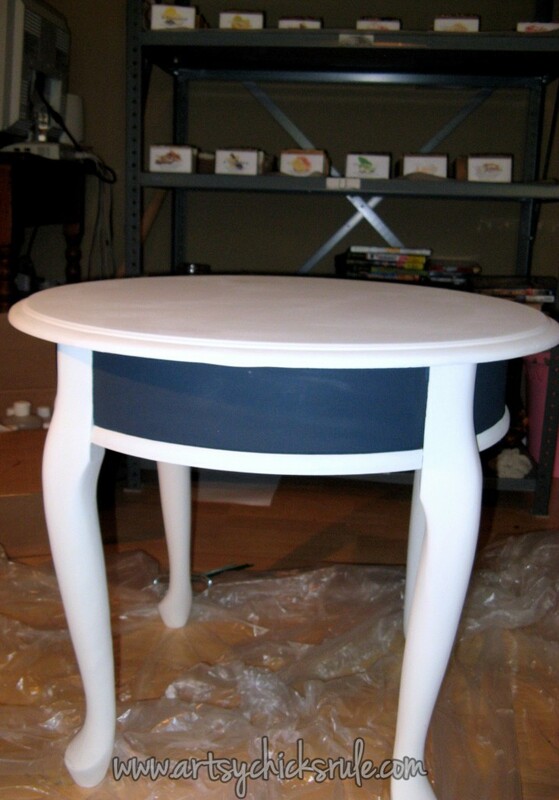 It was my first attempt at using milk paint and I haven’t been completely satisfied with the results. Now this just gave me some inspiration. 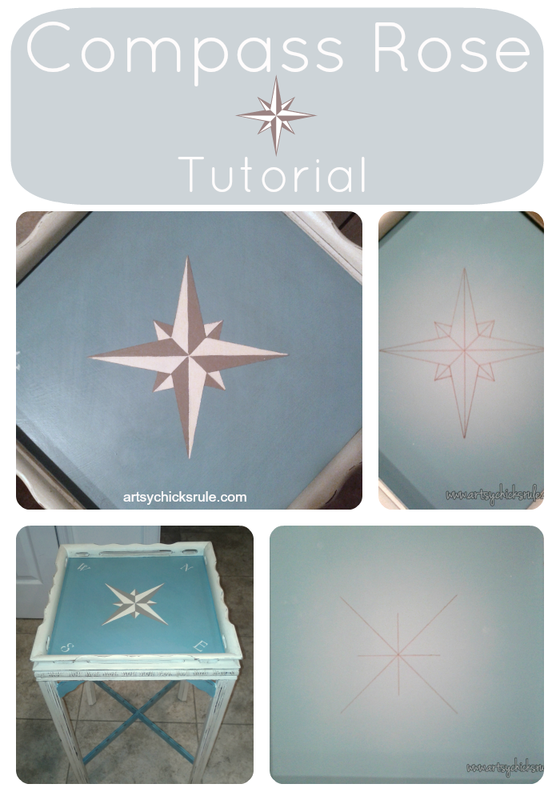 Thank you so much for sharing your talents in this tutorial Nancy! So, so beautiful, Nancy! Your talents always amaze me! Love the nautical element, too. Hope you’re having a great week! Nancy, I know I already told you how much I love this table. This is probably one of my favorites. Just wanted to stop by again and say thank you for linking up to our Get Your DIY on! I hope you’ll find some time to come back again :) Hugs!! 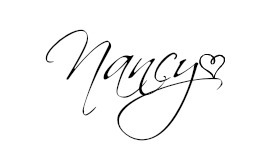 Nancy, I love this! WOW! Great job…pinning it! I absolutely love this!! It’s ironic because I literally just purchased those knobs off of a shop on etsy almost 2 weeks ago and have been anxiously awaiting their arrival! I love the blue mix you did. Do you happen to have the recipe for that? Does the color match well to the knob? 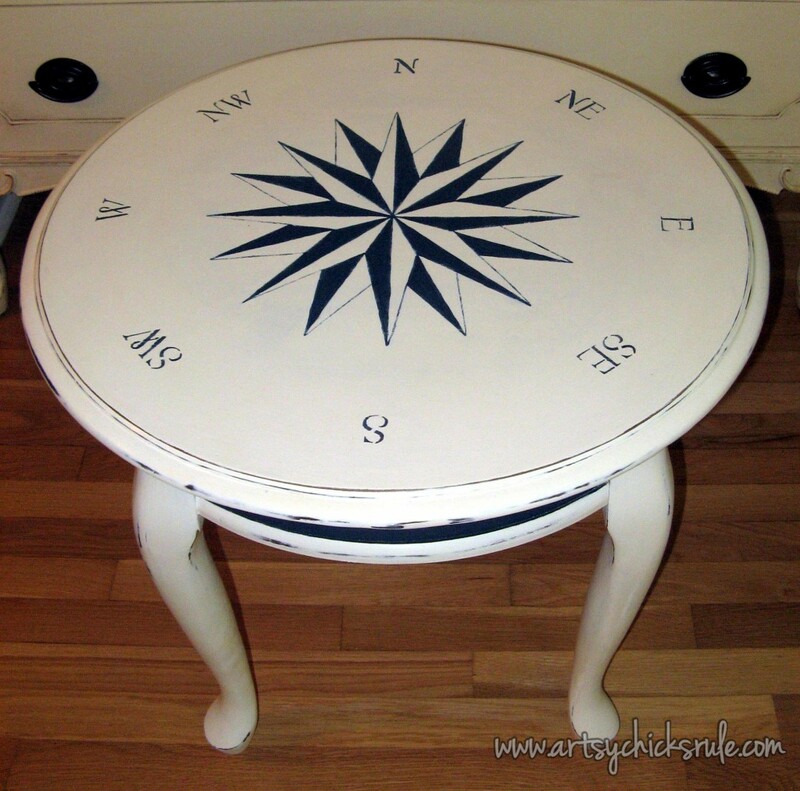 I may have to borrow your clever idea with this table and do a compass too (hope you don’t mind!)! How did you paint in the lines? Did you use painters tape? Looks so tough!! Thanks! 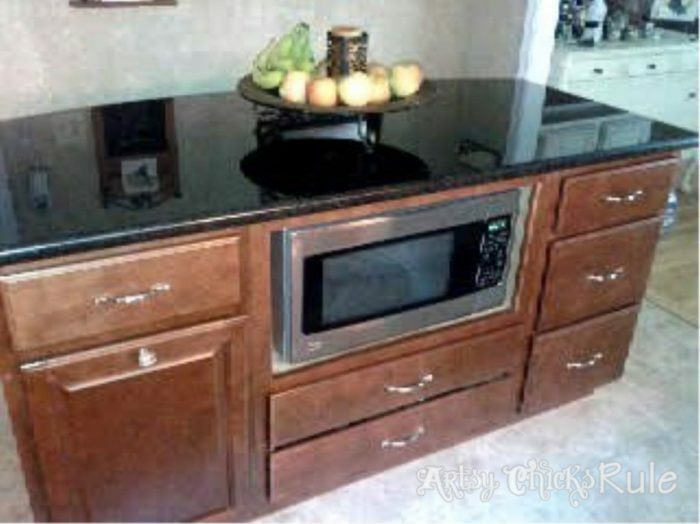 and Oh yes, those knobs are great! I don’t actually have a recipe for it but it was easy to mix and match. :) You just add a little of one or the other to get to the correct tint to match the knob. 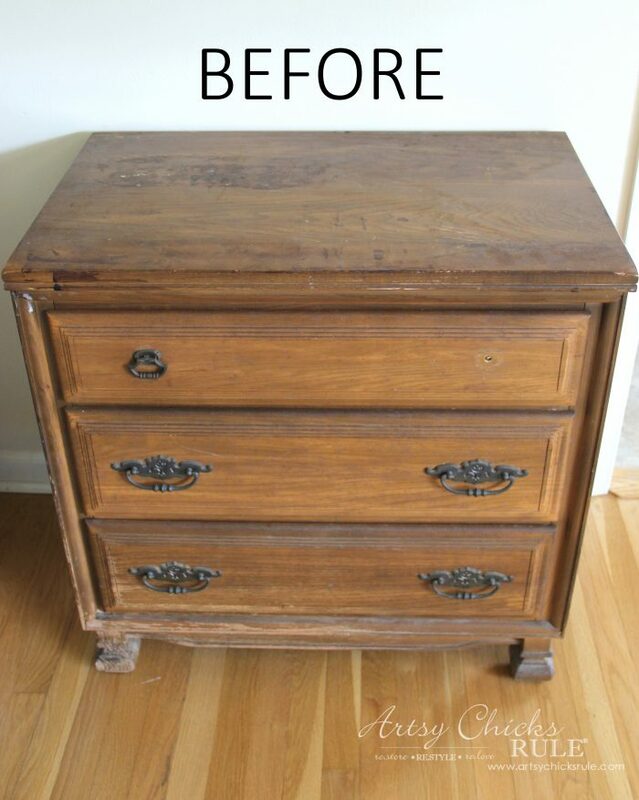 At the point that you have sanded, and painted it and are ready to sand over it, I noticed that the wood that shows through is a dark wood….after you sanded it, did you stain it so that the darker stain shows through after sanding or is that a wax???? I love this! 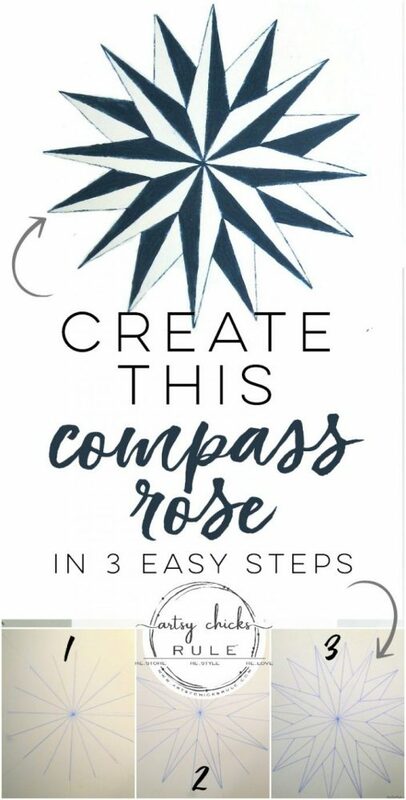 What brush(es) did you use to paint the detailed points of the rose? Love it! You put a lot into this little table that ost would not have! Perfection! I love this table! I also have a question for you. I always seem to have a problem with the darker colored paint dust from sanding smearing onto the white or lighter colored paint that is the base. It’s so frustrating to try and clean that off (I usually have to use a lightly damp cloth and Q-tips to remove it. Do you have any secrets to share that might help me to not have that be an issue? Thanks! :) Yes, that can sometimes be a problem. The only thing I can really offer is to make sure the paint is really dry before sanding. I would think the damp cloth might make it worse? I don’t think I’ve done that but I do believe I’ve done the exact same thing with q tips before! ;) Another idea would be to poly coat it before you sand. That might work better. Sorry I’m not much more help!